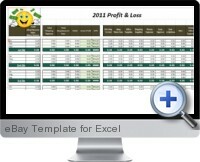 The eBay Template for Excel is a simply and easy Excel template solution for tracking financials relating online sales through channels such as eBay. The template manages bookkeeping and accounting of revenues and expenses for eBay activity as well providing information for year end tax preparation. Adaptable to any online sales channel including eBay and Amazon. Tracks both on site and FBA (Fulfillment by Amazon) inventory levels. Provides tabs for each month from January through December. Consolidated year end sales tab summarizes annual financials. Separate tabs provided for expenditure, revenue and profit and loss statement. Provides sales goal tracking functionality. A mileage log helps to track travel expenses. Additional tabs include next year planning, notes, and BOLO (Be On Look Out for).